"Cyber-related risks are a global threat" as described precisely by the honorable Prime Minister Shri Narendra Modi while addressing the need to build credible cyber security systems amidst the changing threat landscape as India gears up to face cyber security threats. Cyber-security threat landscape in India has evolved over the past few years. During the past four years, India registered over 1,90,000 cases of cybercrime incidents. At present, Cyber-security market in India, stands around $4 billion with the industry exhibiting a growth of over 100% during the similar period. Growing number of internet users and proliferation of mobile and personal computing devices in the country resulted in increased threat level among the users, consequently, leading to growth in demand for antivirus software. Additionally, awareness among several end-users are increasingly rising, urging the users to opt for paid antivirus software solutions; enterprises increased their security budgets and have started investing heavily in these solutions. According to Prijo Samuel, Assistant Research Manager - IT & Electronics, Research and Consulting, 6Wresearch, "Over 60% of the cyber-attacks have been targeted towards enterprise segment during 2016-17. Enterprise segment has always remained a goldmine for antivirus vendors in the Indian market capturing the largest share of market pie. The segment is exhibiting a shift in purchase from standalone antivirus product towards complete security solutions. BFSI and IT & ITeS verticals were the key adoptees of antivirus software solutions in Indian market." "Additionally, the individual segment is still dominated by availability of open source and freemium antivirus solutions in the market. However, the segment witnessed a shift in purchase of paid antivirus software with rise in awareness level. Also, growing mobile user base opened-up significant opportunities for market vendors to leverage upon and is likely to boost the revenues generated from the segment. Market vendors are partnering with telecom vendors to offer solutions based on subscription-based model," Samuel further added. According to Rishi Malhotra, Senior Research Analyst - IT & Electronics, Research and Consulting, 6Wresearch, "Mobile segment is still at the nascent stage of the industry curve. However, the segment is anticipated to clock the highest growth among the other product types. With the advent of IoT, smartphones are expected to account for over 35% of all networked devices by 2020. Moreover, online sales for mobile antivirus software is on the rise with higher preference exhibited towards the purchase of single user multi-device software solutions." "Moreover, Tier-II cities are emerging as the hotspot for start-ups, IT Hubs and BPOs. Government initiatives are leading to increased ICT adoption in these cities making them as a preferred destination for PC and smartphone vendors. Demand for antivirus software is projected higher among these cities as they emerge as breeding grounds for tech start-ups and IT hubs," Rishi further added. Key contributing vendors in India Antivirus Software Market include - Quick Heal, Trend Micro, Kaspersky Lab, ESET, eScan, Symantec, Bitdefender, McAfee, Sophos, and F-Secure. 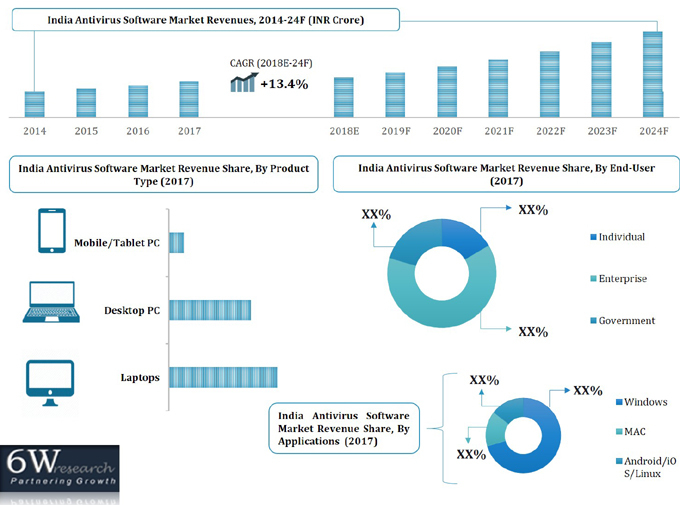 "India Antivirus Software Market (2018-2024)" provides in-depth analysis with 55 figures covered in more than 135 pages. The report estimates and forecast the overall India antivirus market by revenue, end-users, product-types, applications, regions, sales channel, and categorization based on Tier cities. The report also offer key insights on competitive landscape, market share by companies, market trends, market drivers & restraints, and recommendations.